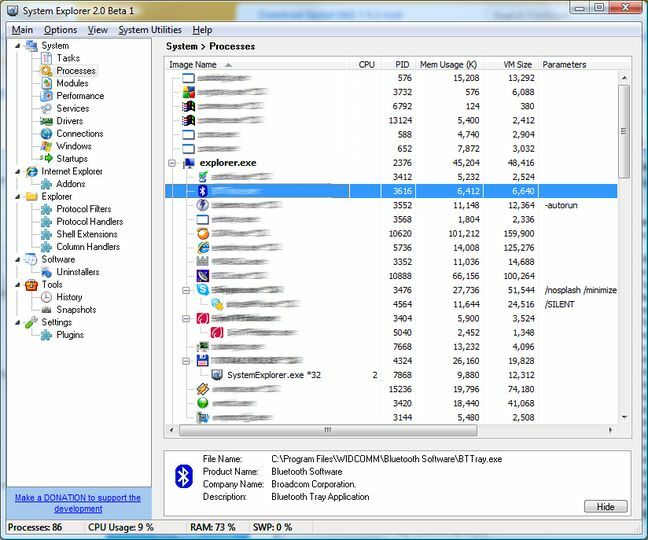 System Explorer is a free application that gives you detailed information about your system. Detailed informations about Tasks, Processes, Modules, Startups, IE Addons, Uninstallers, Windows, Services, Drivers, Connections and Opened Files. Easy check of suspicious files via VirusTotal or Jotti service. Easy search details about file/process via online databases. Launcher ("New Task..." dialog) with integrated AutoSearch and AutoCompletion. Action History for monitoring processes activities. Performance graphs for monitoring usage of system resources in time. System Snapshots for easy finding of system changes. System Report builds rich text report containing major informations about your System. Version 2.0 brings brand new user interface and Windows 7 support. Security feature with online File Reviews. This is the portable version of System Explorer. It doesn't contain an installer and can be extracted to any directory or removable drive. Portable version does not leave any information on the system it was used on.